Liana’s decision to study in the UK was based upon her passion for cultures and languages, and her subsequent endeavours whilst studying at Plymouth – working in hotels, enrolling on language courses, and participating in a virtual language exchange – have been a process of augmenting her understanding of people and their way of life. It was this aspiration to learn about cultures and traditions which encouraged Liana to apply for a Santander Scholarship. ‘'Thanks to daily chats with my host mother I have significantly improved my Spanish during the exchange at Cadiz University. I still remember our warm conversations, walks, and delicious meals. In addition, our two teachers at Cadiz University were always helpful and encouraged us to study. In the beginning, it was a little bit difficult to deal with the grammar, but after practicing at home, I started to understand it. Eventually, I was one of two students who received the highest pass rate in exams out of a group of more than 20 students." After a successful stay in Cadiz, Liana was determined to return and, in the following academic year, she applied for a second Scholarship. "My virtual Spanish friend from Universidad de León inspired me to go to the north of Spain. She said that it is a special place to go to learn the Spanish language and to better understand Spanish culture." 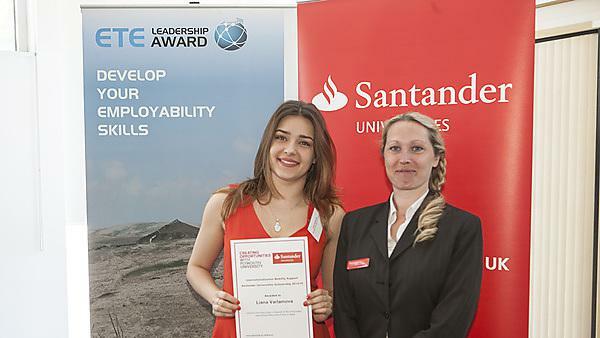 Awarded a Santander Universities Scholarship in April 2015 to undertake an intensive learning project in Spanish at the Universidad Internacional Menéndez Pelayo in Cantabria, on Spain’s north coast, Liana spent three weeks continuing to build upon her language skills which had already been developed during her previous stay in Spain, in the university classroom, and on the dancefloor in Plymouth. "I look for every opportunity to practise Spanish: with my fellow dancers during the salsa, listening to Latino music, and conversing with my Spanish colleagues in Spanish restaurants." An avid salsa dancer, Liana already had a foundational grasp of Spanish built upon an eclectic exposure to the language in the UK; the opportunity to again spend a sustained amount of time in Spain, focusing upon linguistic and cultural nuances, provided the perfect platform to consolidate her all-round language proficiency. "My goal is now to build a tourism career in Spain, and the Santander Universities Scholarship has helped me significantly and, I believe, started me on my way to success. I am now seriously planning on moving to Spain. The language course has helped me to improve my Spanish knowledge and it has also increased my chances of being more competitive in the industry." Her three week experience was hugely rewarding, with Liana grateful for the opportunity to enhance her Spanish skills. "I really managed to improve my Spanish. The fact that I am also passionate about discovering countries and cultures meant that my whole stay was absolutely memorable. The Scholarship has given me an opportunity to improve my Spanish and, because of this, I have come one step closer to my dream: to live, study, and work in Spain."